According to the 2014 Report to the Nation on Occupational Fraud and Abuse, a typical organization loses 5% of its annual revenues to fraud, which is quite a significant amount to any company. The Association of Certified Fraud Examiners further estimates that most of these losses are due to employee theft. Prevention of fraud is more fruitful than recovering from losses after a scam. The broad objectives of probity in procurement relate to the integrity and honesty in procurement transactions. These include provide accountability; maintaining private sector integrity; ensuring compliance with processes; ensuring that all offers will be evaluated against the same criteria; preserving public and supplier confidence in the organisation’s processes; minimizing potential conflicts and the potential for litigation; ensuring the procurement activity provides the best outcome; and avoiding potential for misconduct, fraud and corruption. 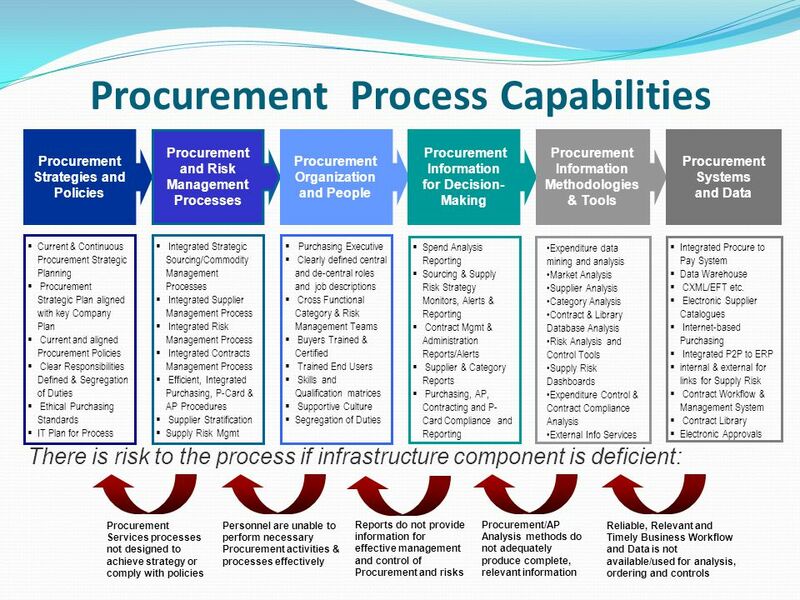 The diagram below shows the areas to develop procurement process capabilities. To prevent this, it is important for companies to take preventive measures. The following six steps can be used to design internal controls aimed to tighten control over access to important documents and company assets. An effective way to prevent fraud in your business is to create a positive work culture. It is important that the business owner and senior management serve as role models of honesty and integrity. If the individuals at the top take a careless approach toward company policies and procedures, they are inviting their employees to do the same or worse. Set clear standards from the beginning by implementing a company-wide written code of conduct, and make it clear to employees that the company has a zero tolerance policy for employee theft. To maintain credibility, be sure to conduct a prompt and thorough investigation of every incident. Cash transactions are more prone to fraud and theft than digital transactions. More than often, internal theft is an opportunity misused than done with malicious intent. Moreover, in retail businesses, employee theft is now a growing concern. Usage of cash makes it difficult to monitor internal theft. Replacing traditional cash-based point of sale with mobile point of sale (mPOS) not only restricts internal theft and fraud, but it will also monitor employees’ behavior and activities in depth. Such mPOS applications can be used to collect money even at your client’s place and not just at your store. One of the strongest deterrents to committing fraudulent acts is the fear of getting caught. Effective internal controls increase employees’ perceptions of detection and reduce their opportunity to commit fraud. Certain duties are inherently incompatible and provide opportunities for fraud. These duties consist of authorization (approval), recording (posting in accounting systems), and custody of assets (cash, signed checks). It is imperative that businesses segregate these duties as much as possible. Often times, a company does not have enough personnel to segregate these duties. In these situations, it is important to put in place adequate, independent checks (i.e., having someone not involved with a process review the process). Something as simple as a business owner reviewing copies of canceled checks can be an effective fraud deterrent. These safeguards serve as an effective transaction verification tool. Consider annual audit, even though it may not be required. An audit will not discover all fraud within an organization, but it will give you an opportunity for someone independent from the daily operations to take a look at the business. An audit also tends to motivate all bookkeeping-related staff to keep things honest because they can never be sure what questions an auditor is going to ask or what documents an auditor may request to review. Businesses should also ensure their assets are physically secured including having locks on desk drawers, keeping overnight cash deposits in a locked safe, and installing security cameras. Proper authorization to approve transactions and documentation also provides fraud prevention opportunities. Limiting authorization and documenting transactions reduces the opportunity for workplace fraud. American Institute of Certified Public Accountants. (2010). “Five Steps to Prevent Fraud in Your Business”.Retrieved from: https://www.vscpa.com/Content/58296.aspx, accessed 12/9/2018. Association of Certified Fraud Examiners. (2018). “Fraud Prevention Tips for Business to Prevent & Identify Embezzlement”. Retrieved from https://www.myrepublicbank.com/fraud-prevention-tips-business-prevent-identify-embezzlement, accessed 12/9/2018. Bijlipay. (2016). “Five Precautionary Measures to Prevent Fraud in your Business”. Retrieved from: https://bijlipay.co.in/blog/five-precautionary-measures-prevent-fraud-business, accessed 12/9/2018. Clarence Tein. (2017).“Critical Issues to Avoid Procurement Fraud”. Retrieved from SIPMM: https://sipmm.edu.sg/critical-issues-avoid-procurement-fraud, accessed 12/9/2018. Putri Pertiwi. (2018). “11 Steps To Prevent Fraud and Theft”. Retrieved from https://canary-whistleblowing.com/blog/2018/02/27/11-steps-to-prevent-fraud-and-theft, accessed 12/9/2018. Tiffany Lau. (2017). “Contrasting Procurement Practices between the Private and Public Sector”. 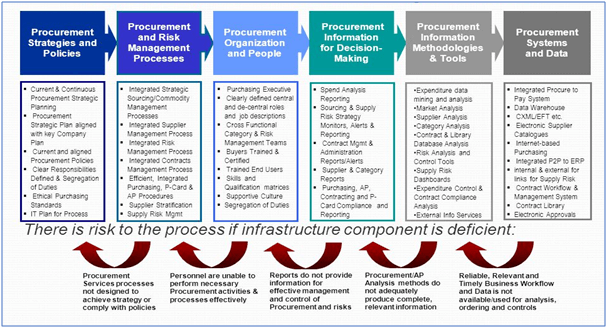 Retrieved from SIPMM: https://sipmm.edu.sg/contrasting-procurement-practices-between-private-public-sector, accessed 12/09/2018. About the Author: Ivy Ng Lian Leck has substantive years of experience in the professional field of procurement management, specifically in the Food & Beverage industry, where she has held the position as a procurement manager in multinational companies. She is a member of the Singapore Institute of Purchasing and Materials Management (SIPMM). Ivy completed the Diploma in Procurement and Supply Management (DPSM) course on September 2018 at SIPMM Academy.